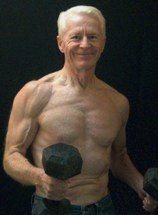 The Gray Iron Fitness Newsletter, Issue #48- Weight Training Builds Senior Muscle. In today's August 15, 2010 newsletter . . .
Inactive men and women over age 30 slowly lose muscle tissue every year. At about age 50 this loss of muscle (and strength and endurance) starts happening faster. And after age 65, it accelerates even more. Scientists have a name for it. They call it "sarcopenia.” It is from the Greek, meaning “poverty of flesh.” It is what we see in frail, elderly people who are bent over from a combination of osteoporosis and sarcopenia, the wasting away of muscle tissue . . . full report here. In the previous newsletter (August 1, 2010), I went over my history in making healthful protein shakes. I won’t repeat it here, but you can easily find it and the recipe by scrolling to the end of this page and clicking on "The Back Issues." When listing the ingredients of my current recipe, I left out any brand names, and I’ve been asked to provide them. But before I do, let me say that I’m sure there are many other reliable brands, and some of mine may not be available where you happen to live. Here are brands that I use . . .
Mixed Berries : Rader Farms (frozen) and sold at Costco. Flax Seeds: We buy ours in bulk at a natural foods store. We grind them in a small coffee grinder we bought at Starbucks. Nonfat Yogurt: Nancy’s brand. It contains several different kinds of stomach friendly bacteria (probiotics) and zero sweeteners of any kind. Whey Protein: BioChem brand. We get plain (unflavored) 100% pure whey. No sweeteners. Soy Milk: Westsoy brand. Organic and unsweetened. I also mentioned taking a fish oil capsule along with my shake. If you aren’t regularly eating wild fatty fish such as salmon, sardines or trout, ask your doctor about taking fish oil. If you do take it, don’t skimp, buying on price alone. Some oils have been found to contain lead and/or other harmful substances. You want a quality, independent lab tested product. Personally, I take Vital Choice Wild Alaskan Sockeye Salmon Oil. It is recommended by some very well-known physicians. It is tested and certified by NFS and the Marine Stewardship Council. I buy it directly from the company.